While fintech payment companies can bring products to market fast, what they often lack is either wide distribution or the deep pockets to fund major marketing campaigns. That leaves one option – partnerships. White-labeling your product with a leading brand is a partnership on steroids. You get both access to a major customer base and the halo effect of an often stronger, more recognised brand. The downside, these deals are very hard to do and take a very long time. As good as this sounds, why are major white label deals so few and far between? Unless your business model is specifically offering white label services (Currency Cloud, INPAY) or you’ve been around a very long time (Western Union) be careful putting too many of these into your 2018 business plan. 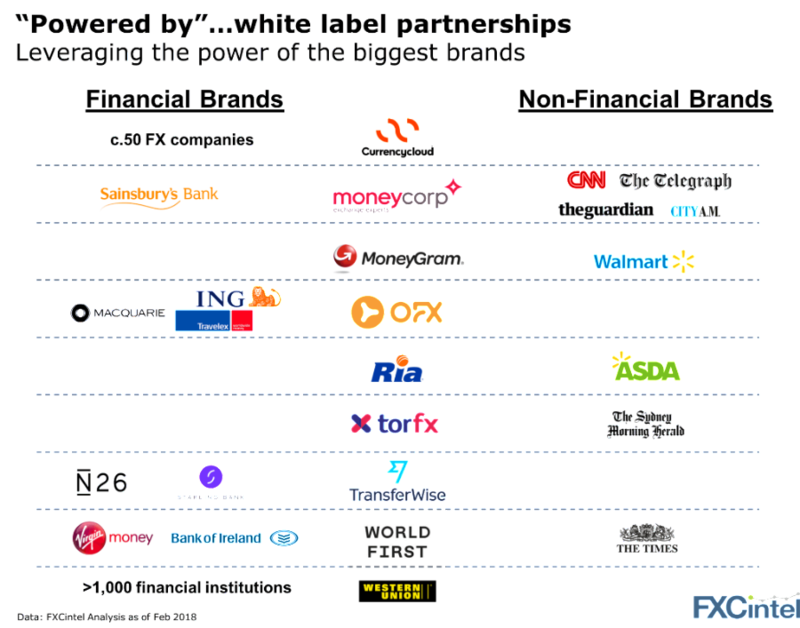 Two key factors explain why only a small number of the world’s major brands have white-labelled FX services (think how many global newspapers aren’t listed or banks not shown above). Trust. Can a fintech a fraction of the size of a bank or large corporate convince the brand to lend their name to its product. Economics. Are the risks from (1) worth the potential return offered? Of the deals shown above, around half were done in the last few years. This suggests the sector is getting better at building a convincing white label value proposition but still has a very long way to go. As the sector continues to consolidate, this week has been busy with several companies being swept up. FairFX announced yesterday it has purchased for £6m long time partner City Forex. We looked at sales multiples of publicly listed companies two weeks ago including that of FairFX. This deal is interesting as whilst FairFX trades at over 11x Price to Sales ratio, City Forex is being purchased at just a 1.4x Price to Sales ratio. Continuing our white-label theme above, Danish company INPAY, a pure white label supplier of payment services announced it has acquired postal payment network Eurogiro. Stay tuned, we expect more acquisitions to follow… Note, as of 30 May 2018, Starling Bank confirmed it has ended it’s parterhsip with TransferWise and will be offering its own payment products.